/ YURI, HERE I COME! He was sitting by himself on the side. His tiny little body made me think he was about 4 years old. He had huge eyes, filled with sadness and quiet resentment for life. He was not smiling nor was he full of joy like the other eighty orphans excited that I had brought colouring pencils and white cards as an ice-breaker activity. We had just arrived. A Team of 6 helpers for 10 days in Grande Goave, Haiti to help the orphanage a few weeks after a devastating hurricane. “Do you want to come to the table with me? Let’s do a drawing together.” did I ask Yuri with a smile. He responded without words. He simply opened up his arms and I understood that I had to take him in my arm. I thought: “He must be the hugging-type.” Actually, not at all. Yuri was new to the orphanage. He had arrived 3 months prior as his mother had disappeared. Up to that very moment, he had not interacted with anyone. He was never smiling, nor playing, nor letting people close to him. I had no idea. I did not know at the time that everyone was looking at me in complete stupefaction as they saw that I was holding Yuri… or that HE was holding me. So tight. Everyone was wondering what miracle could have just happened. Yuri was ‘responsive’. Oh, he was ‘responsive alright! For over an hour, we continued to colour together and he never let go of me. We made a little ‘truck’ together and he patiently and meticulously coloured inside the lines always making sure that I was paying attention to him. No words. Communicating only by the tightness of his grip around me and his deep eyes, begging for me to stay with him, eyes where I could read a past trauma that would take a while to heal. Yuri still never talked to me the whole time we were there, but one day, as we took the 84 orphans to the beach, he actually laughed. Not just smiled. He exploded in profound and genuine loud laughter generated by my husband teaching him how to splash me in the shallow water (as he was still gripped around my neck). I will always remember these moments. I have been sponsoring Yuri since we got back from that trip. This coming March, I will go visit him again in Haiti! Yes!!!!!!! I am going back this coming March! I can’t wait to see him. I receive quarterly news about him and he has now grown so much. I have been told he is now a very lively little boy playing with the other happy kids at Heart 2 Heart Orphanage. My fundraising has already started. When we go to Haiti, we bring money for different projects. We buy construction materials over there and hire locals to teach them how to realize the projects so that the money stays in their community and contributes to their economy. If you wish to contribute, any donation of $25 or more will receive a charity receipt (at the end of the year, they are done manually once a year). I am donating my books for the cause. When you purchase any of my books, between now and March, 100% of the money goes to the Heart to Heart Foundation. My books retail between $16.95 and 23.95. I have decided to put them all at a flat rate $25 or 5 books for $100. You will get a charity receipt for the total value ($25 or $100 or more), you have to pay taxes and shipping separately. 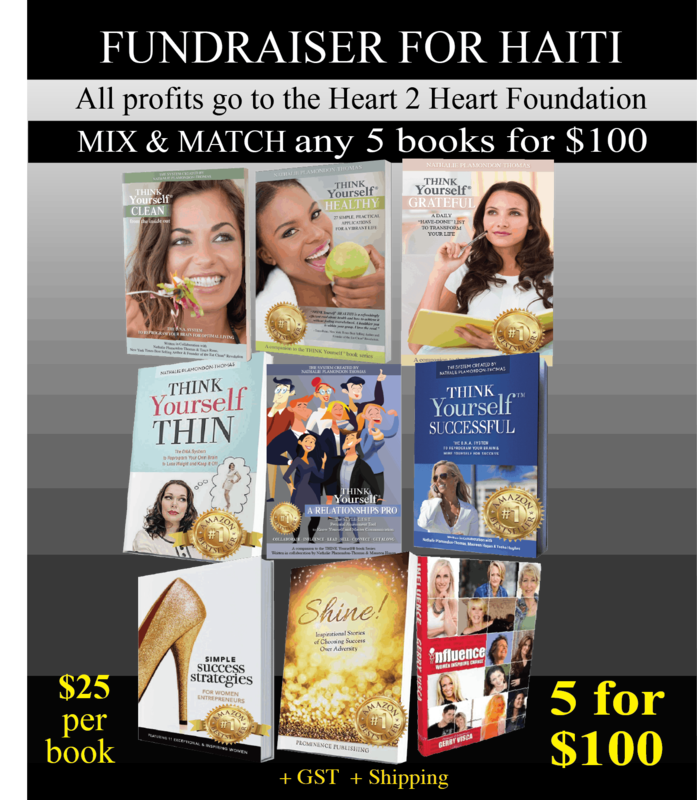 For the 5 books promo, put the 5 books you want in your cart and then enter the code HAITI5BOOKS to get the $25 discount applied to your order. Here is the link to place your order and make your contribution to help the orphans at Heart to Heart.